Ben - In this week's episode of Planet Earth we're looking at one of Britain's best loved mammals, the elusive red squirrel. They've been under threat from a squirrel pox for a number of years and in 2008, the virus decimated numbers of one of the few remaining reserves at Formby, near Liverpool. Sue Nelson visited the reserve to find out more about a four year scientific project, aimed at understanding squirrel immunity and improving red squirrel conservation. There, she met Julian Chantrey from the University of Liverpool School of Veterinary Sciences and Researcher Tim Dale, who was carrying a bunch of very long wire cages. Tim - We've got four of the traps we use for the squirrels. They are in fact, mink traps but they generally use the same principle. Sue - So they're basically just a long rectangular wire cage, aren't they? Tim - That's right. With a pressure plate in the back that has a trigger that allows the door to spring shut when that pressure plate goes down. We usually bait the back of the trap with peanuts, maize and black sunflower seeds are quite favourable. Sue - Where do these go? Tim - We've got two tactics for catching the squirrels. One goes on the floor and the other one goes on the tree trunk vertically. They tend to work better for red squirrels whereas the ground traps work better for greys. Sue - And once you've trapped the squirrels, what do you do then? Tim - The first thing to do - because our first concern is the welfare of the squirrels - is just cover the trap. It tends to calm them down, they don't feel as frightened then and then we'll get all set up with this equipment and sample the squirrels. Sue - Julian, once you've got a sample of blood from a red squirrel, what are you looking for? Julian - We're looking for antibodies to the squirrel pox virus which shows that these squirrels have survived the epidemic back in 2008 and now have antibodies, a degree of immunity to this virus. Sue - And so far Tim, what have you found? Tim - We've found a small number of the population that do seem to have antibodies to the pox virus, which is certainly promising news because it does say that vaccine might be a viable option. In terms of numbers, it is a very, very small percentage and so, it isn't the answer to the red/grey squirrel disease problem. Sue - When you say red/grey squirrel disease problem, is this because a grey squirrel's immune to this virus? Tim - Effectively, yes. It seems that the grey squirrels brought the squirrel pox with them, when they came over from America. And because the grey squirrel has evolved with that virus for a long time, it doesn't cause any clinical disease. So, they're able to carry on a normal life without it affecting them. Sue - It sounds as though this is potentially good news for the red squirrel population Julian, but I do sense, particularly from Tim, a touch of caution there. Julian - Yes, you're perfectly right. You've got to be a bit cautious when you interpret these blood results. 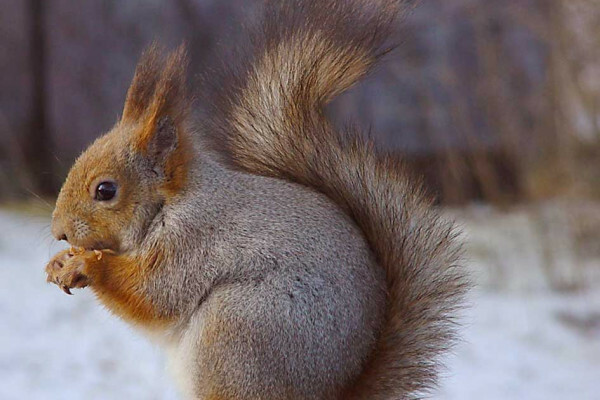 It's good that some of the squirrels have encountered the virus and survived, and now have antibody, but that doesn't necessarily mean that they are immune. All we can do is monitor the population as we are trying to do, making sure that their body conditions, their weight, their fat reserves are up to standard for them to survive through the forthcoming season. If another outbreak occurs, you'd hope that these squirrels will be the ones that survive and their offspring. But we just don't know without monitoring the group. Sue - Tim Dale, you've got a brown cardboard box here at our feet. What's inside? Tim - What we've got here is one of the red squirrels that we've chipped and sampled. When I say chip, that's an identichip so we can identify each individual squirrel that we've caught in the past and we're about to release it after its experience with us. Sue - Okay. All right, are they quite shy creatures? Sue - Okay, you're opening the box. It's got lots of dried hay and straw in there, gently moving it. Oh my goodness! It is small, isn't it? There it went, up a tree. That gave me quite a fright there. It suddenly scarpers, doesn't it? Yes. Wow! Tim - Yes, they don't hang around. They're fast little creatures. Ben - Tim Dale and Julian Chantrey from the University of Liverpool, celebrating the release of a healthy red squirrel with Sue Nelson. Previous What Causes Alzheimer's Disease?